Korean men more than ever are braving the makeup aisle for themselves, leading to a boom in the retail market for men’s cosmetics and skin care products. “Flower men” are in right now, encouraging men to groom themselves. The term “flower men” refers to good-looking K-pop stars with feminine features. More and more men are willing to drop a good deal of money to pamper their skin. In 2011, nearly 21 percent of global sales of men’s cosmetics, equivalent to $495.5 million, were sold in Korea, according to Euromonitor International, a global market research firm. The whopping sales figures made Korea the largest market by far for men’s cosmetics. Although skin care and cosmetics are driving sales, most men are still squeamish about products that seem too feminine. Many skin care companies have come up with a variety of products with colors such as blue and black, with masculine names, packaged in containers reminiscent of cigar boxes and liquor bottles. 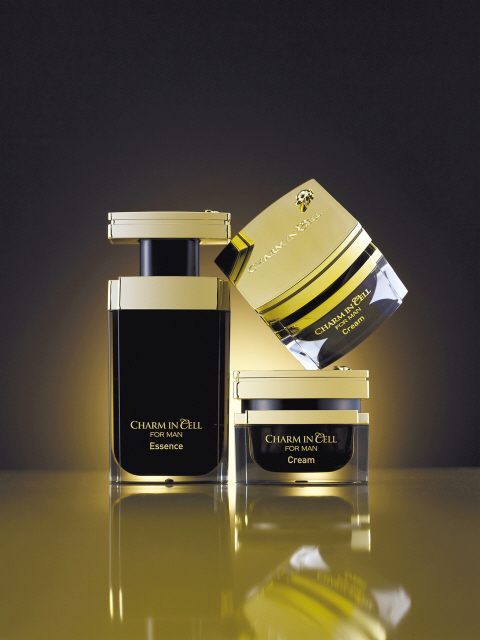 The Charm in Cell for Men line features a serum and a cream, both containing eight unique ingredients, including the company’s patented ingredient L-procera and 34 other ingredients that have been certified for their whitening and anti-wrinkle functions. L-procera is claimed to strengthen the skin, protecting it from moisture loss due to environmental factors. Toco-vita C, an ingredient that combines the functions of vitamins C and E, is a product unique to Charmzone that brightens dull skin, according to the company. Maritime extracts of adenine improve the appearance of wrinkles while alpha-Bisabolol brightens skin tone and nourishes the skin layer. “Most men are exposed to more UV rays, smoking, drinking and factors that contribute to the aging of skin,” said a manager at Charmzone. “This is a line of premium men’s beauty products to help men feel younger.